I did a quiet, contemplative downtown photowalk on Sunday. A little reward for getting all my weekend chores done, including yard work and the dreaded tax return. I finished two returns actually, including the first one for my older son. Yikes. I was downtown about 45 minutes before sundown and picked a rapidly changing area on the west side. I’m following the manic construction in New York City, for a new class of super tall, super expensive residential buildings. Some are even taller than the Empire State Building. 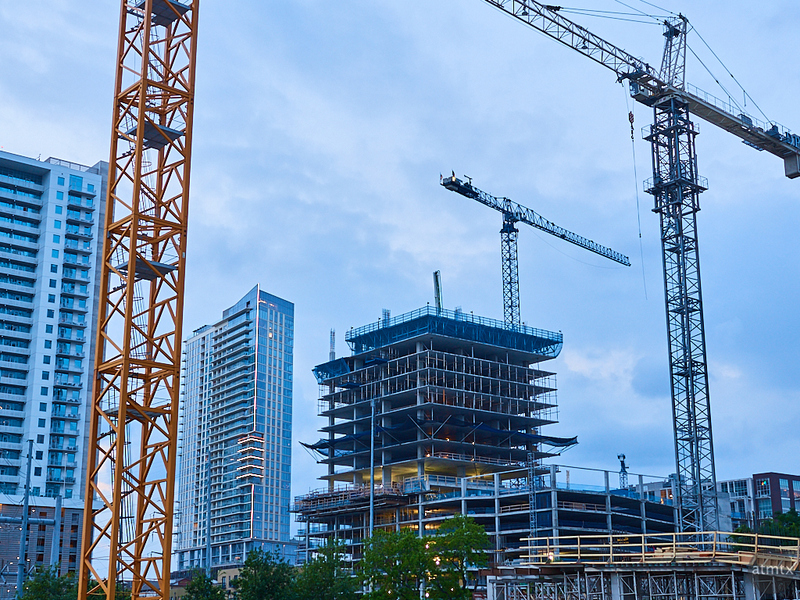 Austin too is in a building boom, though not as extreme as New York. The skeleton in the center will be Austin’s tallest building. Called The Independent, its Jenga like design will be taller than The Austonian and will claim the title of the tallest all residential tower west of the Mississippi. At 690 feet, it’s a mere 7 feet taller than the Austonian but only 1/2 the hight of the tallest New York residences. The world’s tallest building is the Burj Khalifa in Dubai, which is nearly 4 times taller. Fun, just for a frame of reference. So Austin, while growing, is still relatively small compared to the top mega cities around the world. Not that anyone here wants to be a big city. We leave that to Dallas and Houston, which usually compete for the title of biggest in Texas. Here in Austin, there’s a large faction that wants to remain small and quirky. Of course, those romantic notions are long gone. We’re no longer a sleepy college town. Here on the west side, I’ve captured three new construction cranes belonging to three new high rises. The empty spaces, becoming increasingly valuable are being gobbled up for new development. While the density is increasing, it’s not packed like some bigger cities — there’s still adequate space and greenery which strikes a good balance, at least for me. But, who knows in the future. Things have already changed since my downtown photo essay just six months ago. I’m sure in a couple of years, this scene will be a distant memory. Part of my documentation of a rapidly changing Austin. I looked up a picture of what that building will look like when completed, very different, it will definitely look allot different in the skyline that’s for sure, keep sending progress reports! Michael, I think it will be a nice addition to the skyline. It should also fill a hole when you shoot the skyline from the river.